Below deck unit. 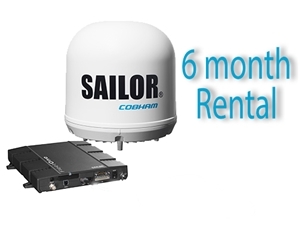 Power consumption: 120 W @ 10-32 V.
SAILOR Fleet One is a maritime broadband system, based on well-proven hardware and network technology, providing simultaneous high-speed data and voice communication via satellite. Perfect for users of satellite phones or other low- bandwidth communication methods, OCENSMail & Web lets you surf the web and efficiently send and receive compressed text and images over email while saving you money on sat phone charges. The OneMessage app is the first of its kind, providing the capability to send and receive text messages in near-real time to all your contacts, both individually and in groups, so you can stay in constant contact no matter where you travel. Background filtering. Permits the processing of data requests placed by any OCENS software or apps. "Simply Need A Position" - With SnapTrack your positions are logged and posted to the snap.ocens.com website so friends and family can follow you on your adventures. To book your rental, you will need to complete and email in the following rental agreement.